Market forecaster Joe Granville was a colorful character in what has always been perceived as a staid and conservative business. The great stock market guru of the 1970s was known for his outlandish antics and prescient market forecasts. He would often appear at lectures wearing garish costumes, including blinking bow ties, electrified sunglasses, togas, Elvis costumes and chicken outfits. Infamously, he was known for dropping his pants and reading stock quotes to surprised observers. On April 21, 1980, he issued a buy signal that was followed by the fifth largest 1-day gain in history at that time, according to John Rothchild's The Bear Book. He also correctly called the top later that year and advised his subscribers to “sell” in January 1981. Granville once told Newsweek, “Many have said I have four times the power of the Federal Reserve,” and “I have solved the 100-year enigma, calling every market top and bottom.” Ever the showman, Granville even predicted that he would win the Nobel Prize for his exploits (he never did). Granville was also famous for “walking on water” at an investment conference in Phoenix, AZ. He momentarily astonished his audience by the feat, which as it turned out, was merely an illusion made possible by the clever insertion of a plank just below the surface of the hotel swimming pool. There are probably enough Granville anecdotes out there to fill an entire book. My all-time favorite is the one where he missed his United Airlines flight at the gate back in his heyday. A perturbed Granville threatened to drop United's stock by ten points if they didn't come back and pick him up. The airline obliged and Granville was escorted to another flight in a VIP golf cart. His peak was between the years 1979 and 1981, when he called virtually every move in stocks in his Granville Market Letter newsletter. He even correctly predicted an earthquake in California in 1979. The ride as the top stock market guru didn't last long, however. It all came to an inglorious end in 1982 when Granville turned bearish at what turned out to be the onset of a major long-term bull market. Making matters worse, he remained steadfastly bearish (briefly getting back in synch with the market in 1987-1989) until 1996, giving him the dubious distinction of being the longest running newsletter bear, according to Rothchild. Aside from his many exploits and eccentricities, Granville was also known as a great market technician. He made some important contributions to the field of technical analysis, including the popularization of On Balance Volume (OBV), which many traders use today. By far the most famous of his sayings is: “The obvious is obviously wrong.” Turns out Granville was a contrarian when being contrarian wasn't cool. Some would consider the foregoing statement to be Granville's greatest contribution to financial market analysis. That statement has certainly been an enduring one and has stood the test of time in the decades since he made it. This famous statement refers to the market's uncanny ability of doing the exact opposite of what the majority of investors expect of it. “The obvious is obviously wrong” is so well known, yet so hardly heeded as advice. The statement is marvelous in its simplicity, yet so profound. Pity that more investors don't remember this mantra, which might be called “Granville's Golden Rule,” when confronted with the daily headlines of the mainstream press. That brings us to the present hour. With news headlines everywhere proclaiming doom and gloom and the end of the financial markets as we know them, how will the contrarian principle withstand this powerful onslaught of pessimism? Will the negative sentiment succeed in repealing the laws of contrarianism? Will Granville's Golden Rule be broken for the first time in memory? The market is now testing and will soon provide an answer as to the veracity of that old Joe Granville saying, “The obvious is obviously wrong.” *Obviously* most investors expect the market to break down and keep falling from here and go into a tailspin. Quite a few commentators are already calling this the start of a new bear market. And there is almost a universal consensus that a recession is knocking on our door. If the principles of contrarianism still apply to the financial markets, then the answer to the above assumptions would be, “It ain't necessarily so!” If Granville's saying still holds true then we should see the market arrest its decline, confirm a bottom soon and eventually resume the uptrend that has been underway since 2003. 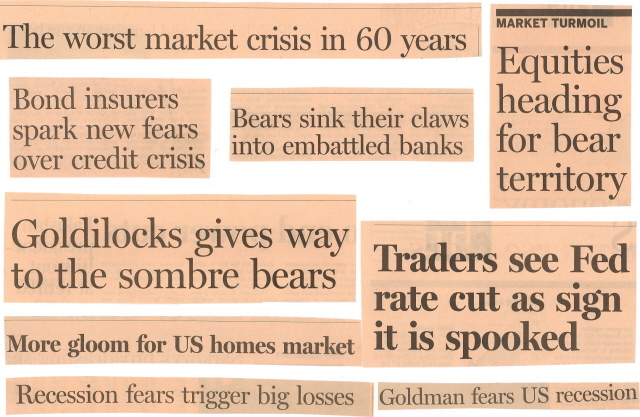 Some have suggested that the financial markets have entered a vortex of fear the likes of which has never been seen. They believe that this time will really be different and that the contrarian principle will cease to work; that reading investing with the headlines instead of against them is the “new style.” In other words, they believe that “Granville's Golden Rule” has failed. Somehow, I don't think this assumption will be proven correct. I seriously doubt the media have suddenly become prescient and truthful (to say nothing of benevolent) in telling us what is really going on within the financial realm. And I don't believe the masses will become millionaires by converting to full-time short sellers.